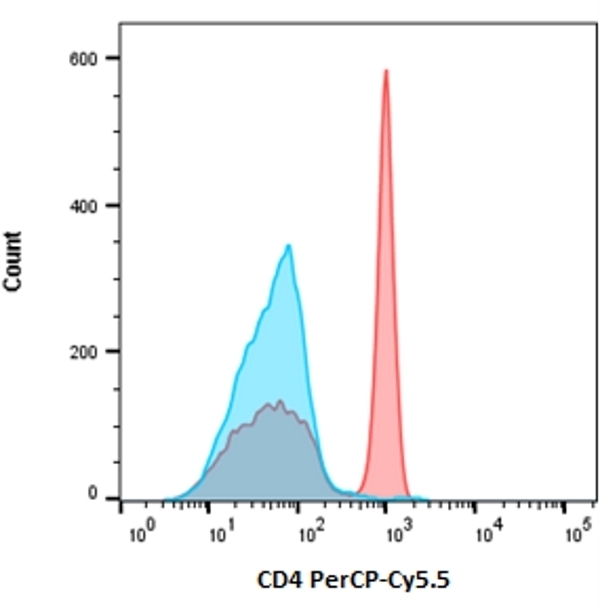 Peripheral blood lymphocytes were stained with CD4 (MCA1267) conjugated to PerCP-Cy5.5 using LYNX Rapid Plus Conjugation Kit (LNK141PERCPCY5.5). The red histogram shows stained cells and the blue histogram shows unstained cells. Data acquired on the ZE5™ Cell Analyzer. LYNX Rapid PerCP-Cy5.5 Antibody Conjugation Kit® enables the rapid conjugation of a pre-prepared lyophilized mixture containing Peridinin Chlorophyll protein (PerCP)-Cy5.5 label to an antibody or protein. Activation of proprietary reagents within the antibody-label solution results in directional covalent bonding of PerCP-Cy5.5 to the antibody. The LYNX Rapid Conjugation kits® can be used to label small quantities of antibody/protein at near neutral pH, allowing a high conjugation efficiency with 100% antibody recovery. 10-50mM amine-free buffer (e.g HEPES, MES, MOPS and phosphate) pH range 6.5-8.5, although moderate concentrations of Tris buffer (<20mM) may be tolerated. Do not use buffers containing nucleophilic components e.g primary amines and thiols since they may react with LYNX chemicals. Azide (0.02-0.1%), EDTA and common non-buffering salts and sugars have little or no effect on conjugation efficiency. The molar ratio of antibody: PerCP-Cy5.5 should be 1:1, i.e. 100ug antibody to every 100ug PerCP-Cy5.5. For optimal results the antibody should be at a concentration of 1mg/ml, with a maximum volume of 100ul and a maximum antibody amount of 100ug. Antibody at a concentration of greater than 1mg/ml requires dilution. Antibody below 1mg/ml can still be used as long as the maximum volume is not exceeded. Using less than the recommended amount of antibody may result in unbound label, but this will be removed during subsequent application wash steps. Antibody below 0.5mg/ml should be concentrated before use with the kit. The molar ratio of antibody: PerCP-Cy5.5 should be 1:1, i.e. 10ug antibody to every 10ug PerCP-Cy5.5. For optimal results the antibody should be at a concentration of 1mg/ml, with a maximum volume of 10ul and a maximum antibody amount of 10ug. Antibody at a concentration of greater than 1mg/ml requires dilution. Antibody below 1mg/ml can still be used as long as the maximum volume is not exceeded. Using less than the recommended amount of antibody may result in unbound label, but this will be removed during subsequent application wash steps. Antibody below 0.5mg/ml should be concentrated before use with the kit. The molar ratio of antibody: PerCP-Cy5.5 should be 1:1, i.e. 100ug antibody to every 100ug PerCP-Cy5.5. For optimal results the antibody should be at a concentration of 1mg/ml, with a maximum volume of 1ml and a maximum antibody amount of 1mg. Antibody at a concentration of greater than 1mg/ml requires dilution. Antibody below 1mg/ml can still be used as long as the maximum volume is not exceeded. Using less than the recommended amount of antibody may result in unbound label, but this will be removed during subsequent application wash steps. Antibody below 0.5mg/ml should be concentrated before use with the kit. 1.To the antibody sample add 1ul of the Modifier reagent for every 10ul of antibody and mix gently. 2.Pipette the mixed antibody-modifier sample directly onto the LYNX lyophilized mix and gently pipette up and down twice to resuspend. 3.Replace cap onto vial and incubate in the dark at room temperature (20-25oC) for 3 hours, or overnight if preferred. 4.After incubation, add 1ul of Quencher reagent for every 10ul of antibody used. Leave to stand for 30 minutes before use.